"What is closest to my heart is the way some of the Colombian leaders have begun applying the Dances and Walks to local situations in their country." For a number of years three Colombian mentors (Fiba Sylvia Murillo, Arjun Jorge Calero and Fernando Castano) and I have been presenting a week long Dance leader training every Easter at Atlantida Ecovillage. Founded in 2004, Atlantida is administrated by the 10 residents who have been striving to find a balance between ecological, social, economical and spiritual values. 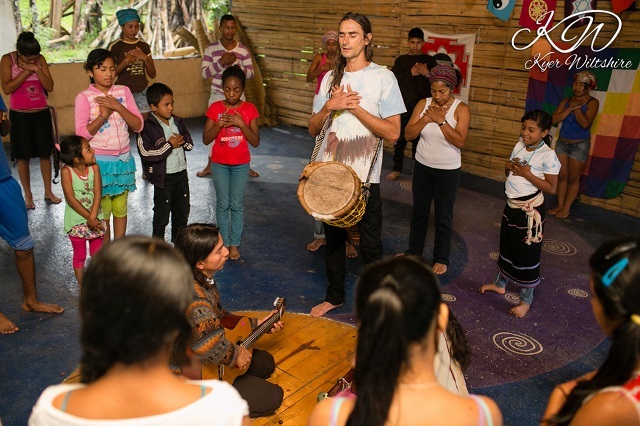 Atlantida is well known as a center for alternative living with educational events and retreats. 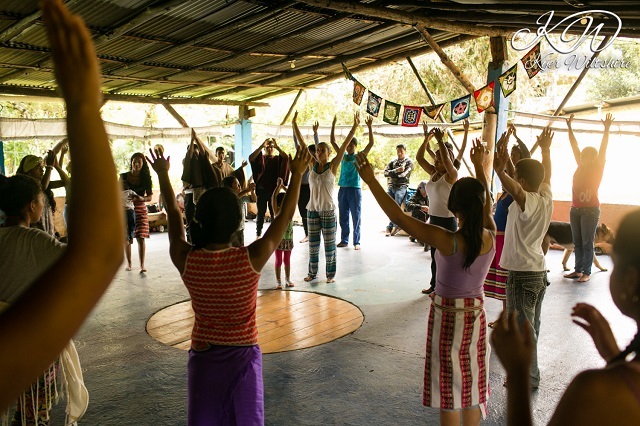 The Dance Leader Trainings have usually had about 100 attendees from all parts of Colombia, with others coming from many other countries in Latin America as well as a few from Europe and the U.S. The quality of work that has developed has been astounding. A core of committed leaders have attended all of these events, and many of them have gone on to become mentors and mentors-in-training who, gradually, over the years, became part of the support teaching team. What I am most thrilled about - what is closest to my heart - is the way some of the Colombian leaders have begun applying the Dances and Walks to local situations in their country. One of the leaders using the dances in her youth leadership trainings is Majida Ana Maria Hoyos, an active mentor and the co-founder of Atlantida. 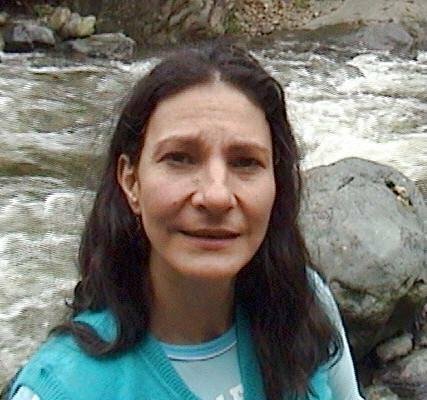 Majida became inspired to create a project she is calling Dancing Peace and Coexistence. A few years ago she created the Dance and Life Foundation through which she has been raising money to be able to take the Dances and Walks to youth living in various parts of Colombia. Now she has expanded this. With the support of a small grant from the Ministry of Culture, she and the other residents of Atlantida are working with an inter-ethnic group of young people (indigenous, afro-descendants, and peasants) to help them develop understanding and tolerance, heighten awareness, develop social and environmental consciousness, and explore the inner dimensions of leadership. The Dances and Walks are the centerpiece of this work. Majida felt that it was essential to work locally. 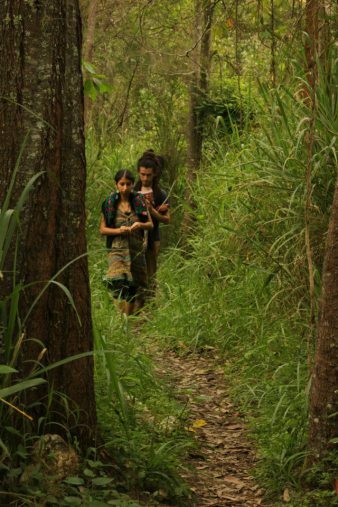 In the rural area of southwest Colombia where Atlantida is located, social tensions arise in an environment of illicit crops, armed conflict, mining exploitation, migration to urban centers, land ownership struggles between peasants and aboriginals, and loss of place, identity and values. This is an especially difficult environment for maturing youth to grow up in, and Majida’s vision is specifically directed toward them. This group of youth not only includes the 3 groups (afros, indigenous, and campesinos [local farmers]), but also a wide range of ages, including quite young ones and some young mothers. All youth drawn to the program are welcome. 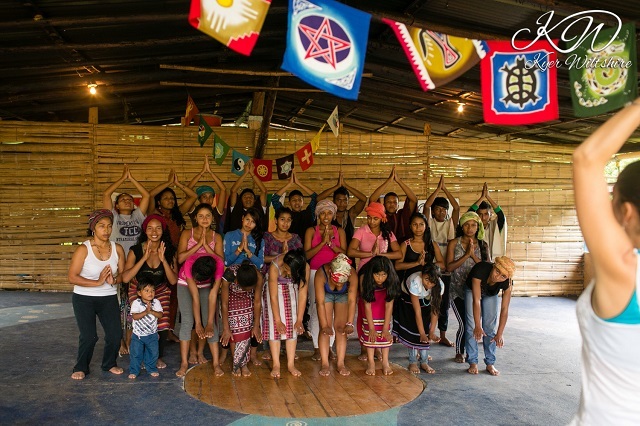 They come together once a week at the eco-village where they find temporary refuge and safety, and where they can taste the flavor of living with spiritual, ecological values. This past year at the Dance leader training they joined us for many of the sessions. At first they entered our large circle tentatively, but before long they were happily integrated, even sharing with us from their own cultures. The proposed objective of this project is to mentor a group of youth who will participate in leadership for social change, environmental justice and spiritual living. YOU CAN BE PART of the circle supporting this project. Please help sponsor the continuation of this process. Even the smallest amount of money will be of enormous benefit. If you would like to contribute or learn more about this project, please contact me (click to email). Another 2 leaders who are using the dances in war torn settings are Shahida and Jamal. 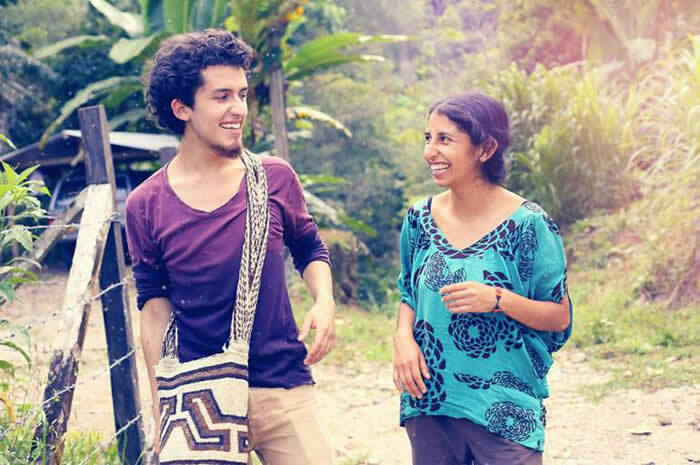 Shahida and Jamal work locally in their own territory, Putumayo and Narino, in south western Colombia. This region, where the Andes meet the Amazon, is rich in minerals, oil and forests, and disproportionately at the effect of war and corporate greed. Shahida and Jamal work under the name Nuh Jay (meaning Sky on the Earth in the local Ahaio dialect), a collective they founded in 2008. 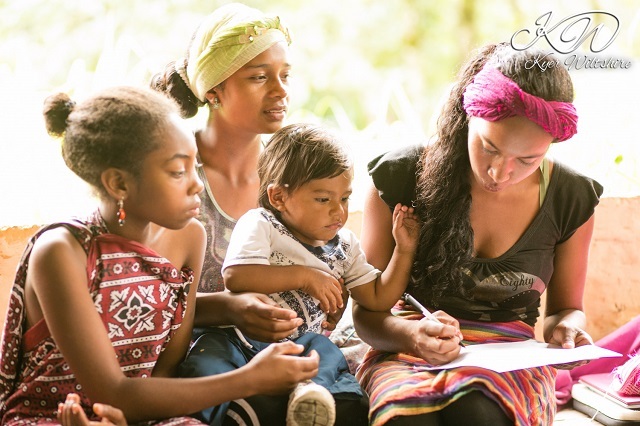 Nuh Jay works with diverse indigenous communities, peasants, Afro-Colombians, youth, women, and children -- all who have been at the effect of violence -- empowering, building resilience, creating intergenerational dialogue, and transmitting the message of love, harmony and beauty. 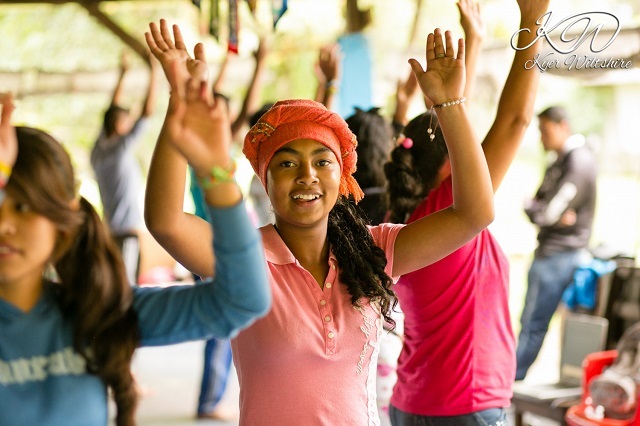 At the heart of their programs are the integrative practices of the Dances and Walks of Universal Peace! As you can imagine, any financial support is welcome and needed. If you are inclined to support this work by making a donation, please contact me (click to email).